I’ve decided that, while I like gouache in many ways, for intense lush color, there’s nothing like my Doc Martins. So I laid down a few layers of watercolor, coat upon coat of three different shades of purple and blue, then let it dry long enough for the paper to flatten out again (an uncharacteristically patient act that meant I couldn’t upload this drawing yesterday morning as I would have liked). 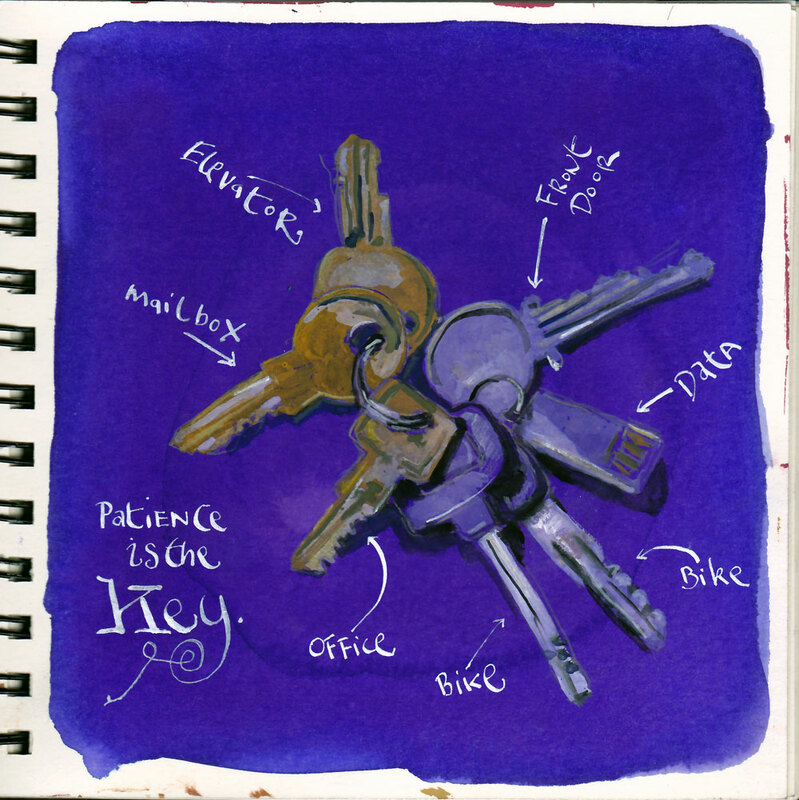 Then I sketched in my keys with a yellow pencil and painted it in with gouache. Finally, I labeled it with a dip pen and white paint. What the drawing lacks in the sort of character and quirk my recent painting of the Jefferson Market had, this one makes up for in careful observation and realism. Me like it. You should like it. It’s very nice! I have been following your drawings for sometime now…and i absolutely love each one of them.One thing i never miss doing everyday is checking your blog. Your on a roll! Love it! me too – like it that is! Makes me want to try my gouaches again. I sure like the idea of one type of paint on top of another type of paint. And how you got that groove in the bike key that is facing up. My eye loves catching little details like that and seeing how you did them. The fluidity of the ink against the opacity of the gouache… I find that it is more difficult to give some light with the gouache, and when I use it… in the end I use it as of the watercolor, by diluting it…. Bravo for your controlof the colorI ! (I like the effect of purple nuance around the office key). ahh – patience is the key…but WHAT is the key to patience??? I find it most difficult to be patient with myself! Thanks for the lovely drawing, Danny! I appreciate the way your work encourages me to look at every day things in such a different way. I love your work, it always is ‘real’ for me and I especially love the way you talk about what you have done, what works & what doesn’t and the types of paints (pens, inks) that you use. Your daily posts are really appreciated and I’m positive I’m not the only one. You are the only other person I know that, like me, has two bike keys on the same ring (and presumably then two locks?). In July I began using the 6×6 coil bound “Super Deluxe Bee Paper” http://owenswain.com/1/edm-10-draw-your-watch-or/ is that what you are using? Can you tell me what sketchbook you’re using. And the size. Most of these challenges have been done in the same book, a 7″ square wire-bound number made by Stillman and Birn. It’s one of their Delta Series with cold press Extra Heavyweight Ivory paper (180 lb.) and a rough surface. I highly recommend their products. Highly. Danny, in answering Sara Macak’s question you answered my query just above as well. So for your and anyone else’s comparison the “Stillman and Birn” has that extra inch on the “Super Deluxe Bee Paper” sketchbook (which I have been highly recommending) above and twice as thick (93 lb / 180 lb). The Bee is 150 gsm (density). I see the Delta series has a 270 gsm. Sounds realty great. I get very, very little buckle with wet media but I’m guessing you would get none. I’ll have to try and locate this product in Canada. 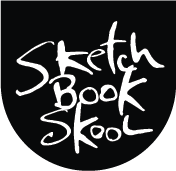 An update for anyone who may still happen by and is interested in the Stillman and Birn line of sketchbooks who lives in Canada, like me, Abovegroundartsupplies.com carries the full line now and Currys.com will be carrying them sometime this autumn. Finally, in my comparison above I should have noted the difference in the number of pages. So the lighter weight but impressively durable Bee Paper has 60 sheets where as Danny mentioned the S&B has 25 sheets and the Handbook Fluid Field are 24 pages. Also the latter two have hard covers. goodness for the web, right?